Instead of adding multiple new accounts one at a time, you can send invitations to multiple users at once. When a user receives an invitation email, all they need to do is click a link to finish setting up their user account. You can choose which users to invite and which account level they should have. Go to Admin > Accounts. Click on the Invite Users button. In the Invite Users window, enter the email addresses for the users you want to invite in the Addresses text box. 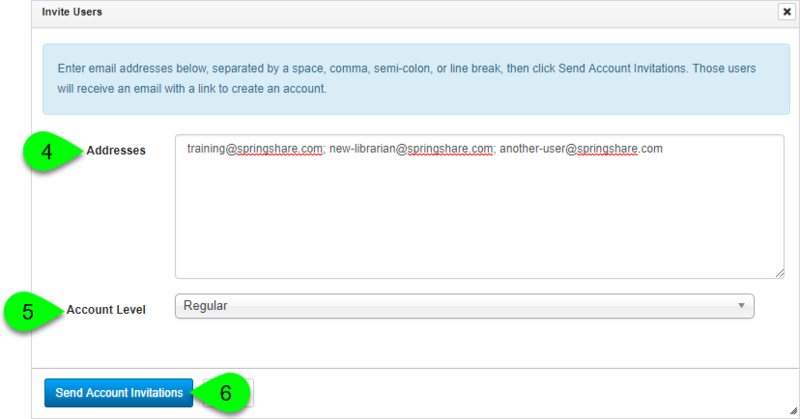 You can separate multiple addresses with either a space, comma, semi-colon, or line break. From the Account Level dropdown, select the account level you would like these user accounts to have. If you need some users to have different account levels, then divide them up into multiple invitations (one invitation for each account level). Click the Send Account Invitations button. Each user will receive an email notification containing a link to set up their account. Click on a column heading to sort by that column in ascending order. Click it again to sort in descending order. Use the column filters to narrow the list by ID, Email, Invited By, Level, Invited, and Processed. The Invited column indicates the date and time the invitation was sent to the user. The Processed column will indicate the date and time the user set up their account. If this is empty, then the user has not yet set up their account. Use the navigation options at the bottom of the table to move between pages of users. Use the Copy, Excel, and PDF buttons to copy or export the list of users currently displaying on the page. Use the Export All Records option to export the entire list of users, either in HTML or CSV format. If an invitation has not yet been processed, you can either resend or revoke it. To resend an invitation, click on its Resend Invitation () icon in the Actions column. The user will be sent another invitation email with a new link for setting up their account. To revoke an invitation, click on its Revoke Invitation () icon in the Actions column. This will invalidate the link in the user's invitation email. If the user clicks it, they will be prevented from setting up an account.